This recent post by Head Start Director of Portland, Ron Herndon, outlines serious concerns about who exactly is making education reform decisions in Oregon. Clearly, not teachers or educators as only one of the OEIB members has actually taught in the classroom. Herndon also wants citizens and taxpayers to follow the money. Doctors bring in doctors to improve their craft and policies. Lawyers bring in those with law experience. Why is our state bringing in little if any educators, parents, or students into the decision making process? Is it because they have all sat in a classroom as a student at some point in their lives and that seems to be enough? Well, that's ridiculous. The job of a teacher can't be quantified like this OEIB business model would like it to be. Teachers are craftsmen and women. I was reminded of this at the Thursday night OEIB public input meeting as a teacher next to me stated how our job is really a craft and that people need to be reminded of that. Teachers are constantly working to meet the needs of our individual students, and it takes a lot of know-how and experience to do that. We are educating human beings, not manufacturing a new product on an assembly line. But that's the way the new OEIB waiver plan is heading with its focus on competition, high-stakes testing, narrowing of curriculum, Achievement Compacts, and receivership for low performing schools...and that is just for starters. "Composing an educational panel with a makeup of members holding less than a proven record of success is a disservice to taxpayers and makes a sham of professed intentions regarding achievement gap and school readiness." Thank you Ron Herndon, for raising more important questions that we need to be demanding from those in charge. One of our Oregon SOS members just had a letter published about his and our concerns with the NCLB Waiver. Steve reminds readers that the waiver plan has its many problems from high-stakes testing to Achievement Compacts. "So we need to address the actual problems. We need to get kids reading more, and get the help for kids who are struggling so that all kids can leave school able to read well. This has nothing to do with testing. Writing is similar. We need to get kids writing more and focus in on those kids who are struggling. Then we need to look carefully at our curricula so we are sure we are teaching what young people need to know to get along in a complicated and changing world. Right now our obsession with testing is hindering this more than helping it. Thirdly, we need to encourage kids to graduate. The best way to do this is to make school engaging and relevant. Testing does just the opposite. It pushes kids out. So, take a look at the waiver and the OEIB Report to the Legislature and see if you think they adequately address the real problems in the schools. The clear and only answer is: They don’t." Speak out! Contact your legislators who will be in session soon, and let them know of your concerns. It will be up to our legislators to slow down or derail this train wreck from destroying our public education system. Keep the letters to your local newspaper coming. Find Oregon SOS on Facebook and this blog to keep up on our posts and updates. Your voice will not be alone. I and many other Oregon SOS members attended a public feedback forum for the OEIB NCLB waivers at the Immigrant and Refuge Community Organization center last night. There were about 200 people there from all sorts of backgrounds: teachers, parents, grandparents, college level educators, legislators, a few daycare providers, Early Childhood Learning teachers, MHCC community college president, a couple of superintendents, and some school board members to name a few. After receiving an overview of the OEIB and NCLB waiver plan, it was time to discuss issues with our table mates. Our job was to discuss what was going well as well as the challenges we faced in our communities with regards to education. Then we were to discuss the same for the waiver plan. At our table (and many others) one clear and consistent message came through: teachers dedicated to their craft and their relationships with their students was the one thing going right. What else was clear was that their was very little that the room found to be positive about the waiver plan. If anything, people were happy the waiver focused on early childhood, but that was about it. As far as challenges to the waiver, the list was lengthy: lack of funding, no idea of how much the waiver plan was going to cost, continued use and dependence on high-stakes testing, no real plans to help offset poverty issues, possibility of allowing privatization of public education, narrowing of curriculum, loss of programs, lack of educator, parent, and student input; these were the primary messages that came up. "This all started when 11 states had asked for waivers, after the DOE announced they would offer a "flexibility package" from some provisions of No Child Left Behind, especially ones the states felt they couldn't reach by the target dates set by NCLB. States submitted what is called an ESEA Flexibility Request. This link will take you to a Word document which spells out exactly what should be in the request, and how it should be organized. It's really a template that all states must use to get the waiver." "Summing Up I have read Georgia's Race to the Top grant proposal and the Flexibility Request. What have we done? We've lost our way in the world of reform led by people who know very little about the lived world of students and teachers. To improve schooling, reform has to be led from the ground up by educators working at local levels." It is clear that many voices raised important questions and issue about the waiver plan, the real concern is will the state listen to reason and to their citizens? Another post will follow that is more focused on choices other states are making and why with rejecting Duncan's waivers. OEIB Public Input: The Time is Now! 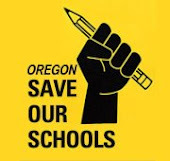 We have so much going on in the next month here at Oregon Save Our Schools. Of the utmost priority are the Governor's OEIB public input meetings to be held around the state. The first one is tomorrow, Tuesday, Jan. 17th in Rock Creek. On Wednesday, the 18th, the meeting is in Salem. On Thursday, Jan. 19th the public will meet at the Immigrant and Refuge Center in East Portland, 10301 NE Glisan. Events all start at 6:30 and run until 8:30. Here is a link to the meeting time, info, and agenda for the complete list of these public meetings. We need to speak up now as the Governor is planning to take his plan to the state legislature in the February 2012 session. Come to ask questions such as: How does this plan help students in poverty? What about class size? What are Achievement Compacts and how will they affect local control? How much will all this cost the state to implement? What other ways will students be assessed other than by high-stakes state testing? How does this plan help to create a well-rounded education for my student so that they receive PE, music, library, art, drama, etc.? What happens to schools that continue to not meet state test requirements? What is receivership? What other education models have been reviewed in creating this plan? Why are schools still labeled? How is this different that what we are already doing with No Child Left Behind? Is there time to come up with a better plan? Come join us and stand up for public education in Oregon. Thanks!